This was my first time attending an all-N-scale show, and I grossly underestimated the danger. At a typical train show, I can cruise the aisles and ignore the 80% of the sales tables full of Lionel, blue-box Athearn HO, old calendars, or other items of no interest to me. No such luck here. 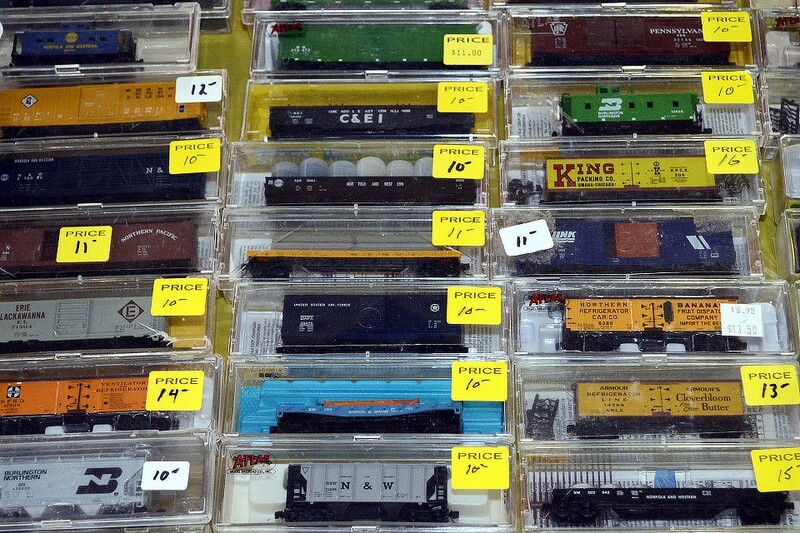 This shows, on the other hand, had N-scale temptations on every single table. The variety was impressive. I saw everything from 40-year-old Rapido to brand-new BLI. My purchase budget was blown within minutes of Saturday’s show opening, naturally. I came away with a Kato locomotive, a decoder to fit it, and three freight cars that I just had to have slightly more than the dozens of other freight cars I just had to have. The show was not particularly large, but it had a number of operating layouts. It seems like every N scale club in the northeast brought an Ntrak layout, or T-Trak, or both. I didn’t bring any of my T-Trak modules, but I had some rolling stock along, including my trusty C-Liners. I left my Kato Broadway Limited set home. Everyone else brought theirs, of course, because…it’s Altoona. This is the town that Pennsy built, after all. No, I didn’t get a chance to visit Horseshoe Curve, or the tunnels, or the Railroaders Memorial Museum, or any of the other railroad-related attractions. To do so would have meant taking a day or two off work and stretching the weekend, as some of my clubmates did. As it was, we departed home at 4:30 Saturday morning, drove five hours, and arrived right before the show’s opening. As soon as teardown was mostly finished on Sunday, we left for home, and I got to bed on time. I don’t know if I’ll make it next year, but I’m sure going to try.